This article is about the place in the majority of the Mario Party series. For the place exclusive to Mario Party Advance, see Koopa Bank. 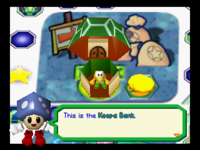 The Koopa Bank is a place found in the Mario Party series. Whenever a player passes the Bank Space, they have to pay five coins to the Koopa Troopa. When a player's turn ended directly on the Bank Space, the player is awarded all coins that have been previously paid on all Koopa Banks on the gameboard. If the player was less than 5 coins, it also pays in a lower number. Mario Party 2's Bowser Land has special banks, known as Bowser Banks, with the opposite function of Koopa Banks. They give five coins to every passing player and demand the whole sum from a player that landed on the Bank Space, or a star if they have no coins. Mario Party 3 features a rare item, the Koopa Kard, which allows the player to claim the Koopa Bank's coins when only passing the Bank Space. The Koopa Bank does not appear in Mario Party 4, instead being replaced by the Lottery Shop. The pre-set Koopa Banks are replaced with the Koopa Bank Capsule in Mario Party 5. The player can throw the Capsule on a space and create a Koopa Bank with the same functions as in Mario Party 2 and 3. Shroomlock also conducts an investigation at a Koopa Bank in Mario Party Advance, after the bank was robbed. This page was last edited on February 7, 2019, at 22:02.